The Tribal Historic Preservation major is committed to training resourceful, skilled, multi-disciplinary preservationists and promoting the involvement of tribal people and governments in cultural resource management that respects and values indigenous ways of knowing, oral tradition and Native ideologies. The THP curriculum is grounded in a unique combination of Native American Studies, History, Anthropology, Natural Resources, Museum Studies and Native Language Studies. It emphasizes the ways in which indigenous groups, archaeologists and museums have successfully integrated Native philosophies and principles into preservation programs, including approaches to consultation, interpretation and representation, field techniques and archaeological methodologies. This course of study also examines the range of historic preservation programs that have fostered mutually beneficial and culturally appropriate collaborative research while empowering and contributing to Native communities and institution. 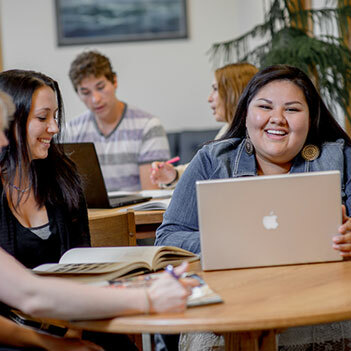 Course work highlights Native American perspectives in history, anthropology, representation, ethics, state and federal law and policy as well as contemporary issues. Strong written and verbal communication skills, active listening skills, technical and professional writing and cultural appropriate communication abilities. Well-developed skills in locating, understanding and making use of written materials in historic preservation and cultural resource management. Increasing awareness of one’s own cultural values, beliefs, norms, history and attitudes and how these contribute to a preservation ethic and worldview. Gaining an understanding of the cultural dimensions human diversity and specifically how and why an understanding and appreciation of the past can contribute to contemporary society. Developing the ability to navigate multiple cultural situations and to deal in an effective and professional manner in pursuing the goals of historic preservation in tribal and non-tribal settings. Increase knowledge of Salish and Kootenai cultures as well as the understanding other Native American societies and other cultural groups in the United States. The Tribal Historic Preservation Bachelor of Arts Degree curriculum builds upon the knowledge and skills of the Associate of Arts Program, providing students with a broad-based knowledge of historic preservation strategies, archeological and historical methodologies, historic preservation field techniques, Native American civilization, language, material culture, arts and science. Students will become familiar with the application of the social sciences, humanities, technology and law in pursuit of historic preservation goals as articulated by elected tribal governments, elders and communities. Graduates with the Associates of Arts degree in Tribal Historic Preservation will be qualified for entry level positions in tribal historic preservation offices, tribal cultural departments, tribal museums as well as employment as archaeological technicians with private cultural resource management firms and government agencies. Gain practical experience in the application of tribal historic preservation methodologies and be able to relate this experience to course content. Gain an understanding of how historic preservation principles are practiced in a variety of tribal settings. Graduates with the Bachelor of Arts degree will be prepared to obtain employment as managers or directors of tribal historic preservation programs, cultural departments, or tribal museums as well as mid-level positions in historic preservation programs in state or federal agencies as well as private cultural resource management firms and museums. Graduates with the Bachelor of Arts degree will also be qualified to continue their education in graduate school and earn their Masters or Doctorate. Having done so, these candidates can look forward to employment in senior positions in tribal historic preservation programs, state or federal agencies, private cultural resource management firms and academia. Demonstrate a broad base of knowledge in tribal historic preservation and cultural resource management subject areas, including methodologies, ethics, Native culture, Native language and anthropology. Develop baccalaureate level skills in writing, public speaking, computer applications and interpersonal communication. Develop the ability to conduct original research including literature review, fieldwork and professional reporting. Develop flexibility in working within and across cultures by building upon cultural knowledge and awareness. Integrate Native American cultural perspectives into knowledge and application of tribal historic preservation and cultural resource management theory and be able to apply this knowledge to issues, perspectives and situations encountered in professional settings both on and off the reservation. Contact the Tribal Historic Preservation Dept. for More Information.